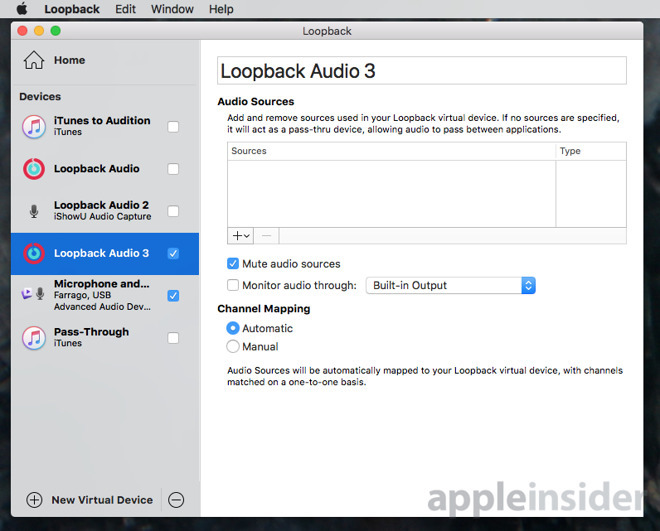 You'll buy Loopback for one job, and then keep finding more uses for this sound routing app for your Mac. There are reasons why musicians choose Macs instead of PCs and Loopback 1.1.5 is one of them. It's an app that reroutes audio from one piece of hardware or software to another. From podcasting to music mixing, it's a small utility that does a lot. Perhaps the most common type of use for Loopback is when you need to record several audio sources but your recorder is limited in some way. 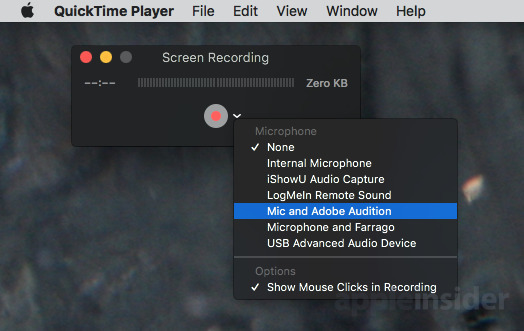 Say you want to record a screencast showing some app on your Mac and to also add an audio commentary explaining what you're showing. You can do that in the QuickTime Player which comes with your Mac, but that forces you to make a choice. 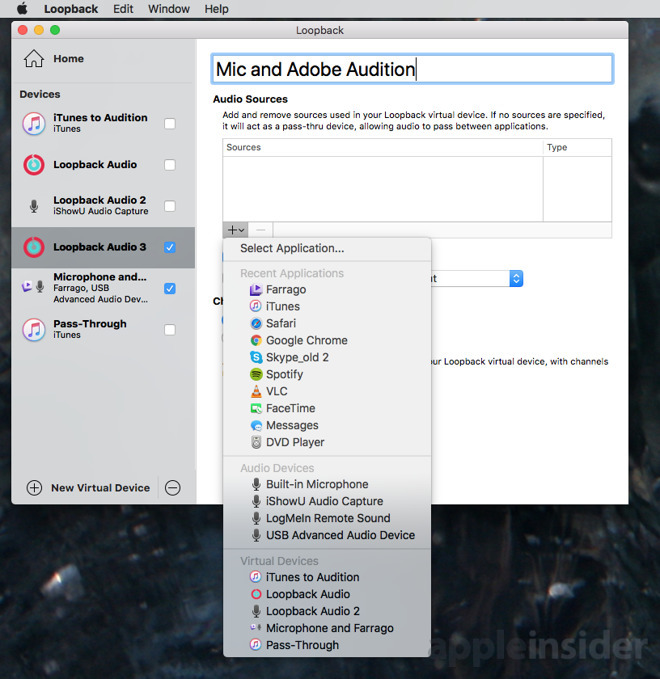 You can either record the audio from your microphone or you can capture all of the audio that your Mac makes. You could settle for the latter and just accept that you'll have to record your voice again later, but then during the screencast you get interrupted by the bleep of incoming email. With Loopback, you instead create a new audio source that combines everything you want. In this example, we want audio from both our microphone and Adobe Audition. You can add any physical audio device you have connected to your Mac and you can add any app at all. When you do this, other apps like QuickTime Player will see your new Loopback source as being a single audio device. If you ever worked with analog audio recording then Loopback is like the kind of patchboard that terrestrial radio desks used to have —and may still, it's been a while since we've been inside one. Where once you could replace a CD player with an extra microphone on those desks assuming the sleep-deprived engineer would let you, here you can take the output from any number of audio apps and route them to any recorder you want. We've even found uses for it as ordinary consumers of audio. Say a friend is going to be on Beats 1—tell Loopback to route audio from iTunes to Adobe Audition and now you can record her show. That's probably not something we'd have gone out to buy Loopback to do but it is one of those things you find yourself using it for. You buy Loopback because you're making a podcast and the next thing you know, it's proving to be a solution to other audio issues you have. Even so, when we examined Loopback's new stablemate Farrago, we said that this kind of software was niche. It's certainly true that the number of people who'll use this is a fraction of, say, Microsoft Excel users. However, makers Rogue Amoeba tell us that they've been startled at just how many people buy Loopback. They stopped short of telling us actual numbers. It seems that part of the reason for larger than expected sales is that so many different types of users have work that benefits from Loopback. That's going to increase when you combine Loopback with the separate Farrago. Where Farrago is a soundboard that gives you instant access to your library of sound clips for, say, a podcast, Loopback is how you can play that audio down a Skype connection. We make it sound as if we use Loopback every day —in one way we do. Every time we do any audio work, Loopback is now in the mix somewhere. Yet, we will go months between actually opening the Loopback app to do any new work. It's a case of set and forget it. We did that routing from iTunes to Audition and forever afterwards, that is an audio source available in the Adobe app. We don't have to keep setting this up or even to keep remembering that we did it in Loopback. That does mean that each time we do open Loopback, we have to think to remember how we used it. Yet once you have a specific task you want to do, making it happen in Loopback is straightforward. Well, it's as straightforward as you want it to be. Starting with version 1.1, you could create any number of these Loopback combined sources like microphone/Audition and then nest them together. So you could nest, for instance, our screen recording combo of app and microphone, with the iTunes to Audition and record everything together until your head hurts. Rogue Amoeba has just announced that it will be refining Loopback's design some time later this year to make it clearer to use. While extra features and a fresh look are welcome, we don't need it. 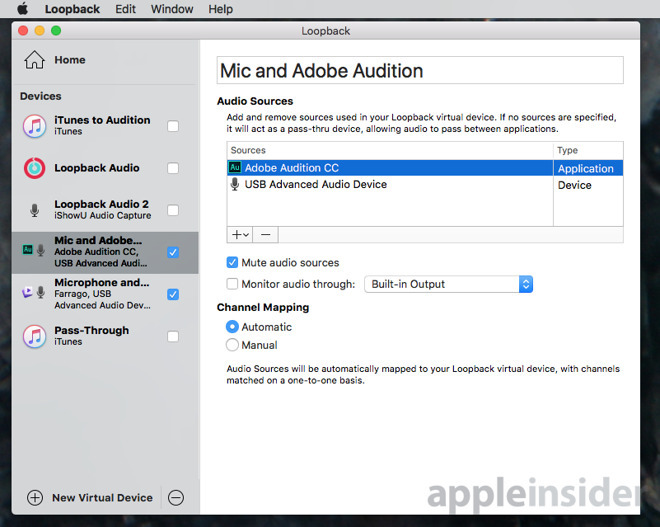 We have no criticism of Loopback at all and if you work in audio, it should be on your Mac. 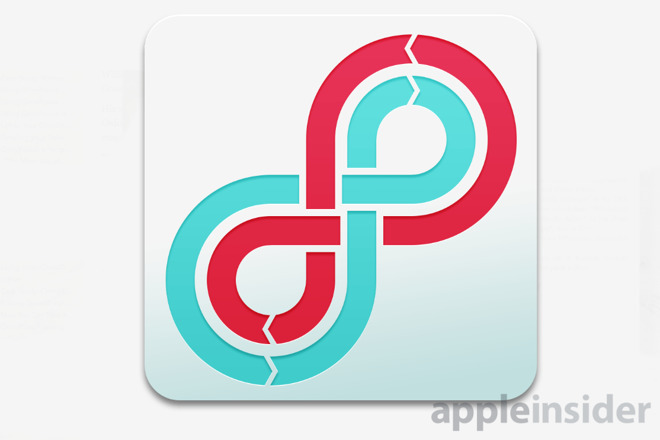 Loopback 1.1.5 is available directly from the makers and costs $99. There's a limited trial version available on the official site too.